Following the rapid southward motion of Petermann’s 2012 Ice Island (PII-2012) via MODIS satellite imagery, I noticed a larger piece of Steensby Gletscher nearby breaking off. Steensby discharges into Sankt George Fjord whose upper reaches are narrower than Petermann’s (4.5 km vs. 15.5 km wide). The new ice island is smaller than the Manhattan-sized ice islands from Petermann, but it is still about three times the size of Manhattan’s Central Park (~ 10 km^2). Steensby Gletscher and Sankt George Fjord on Aug.-15 and Aug.-24, 2012 (top) and fjords and glaciers of north-west Greenland facing the Arctic Ocean as seen by MODIS-Aqua on Aug.-24, 2012 13:45 UTC (bottom). All data are shown at 250-m spatial resolution. Note the segment of Steensby Gletscher which is separating from the glacier to form a new ice island. The floating ice shelf of Steensby Gletscher is also two to three times thicker, but it moves more slowly. It appears, that a lateral crack or rift broke off sometime between Aug.-21 and Aug.-22, 2012 to form the ice island, this one about 1/10 the size of PII-2012. This latest calving is about 7 years of steady advance of this glacier. Comparing the front of the glacier with that observed in 1947, 1953, and 1971, I find its current site well within the earlier bounds reported by Dr. Anthony Higgins of the Geological Survey of Greenland. The same cannot be said for Petermann Gletscher about 40 nautical miles to the south-west. Unlike Petermann’s Ice Islands, Steensby’s are likely to linger and stay inside its fjord for several years as many of those calving from neighboring Ryder and C.H. Ostenfeld Gletschers do. Michael Studinger of NASA’s IceBridge project provides stunning aerial photography of Steensby Gletscher when he flew over North-West Greenland in May of 2011. Addendum 8-25: Mauri Pelto posted equally stunning high-resolution Landsat imagery and provides more context, analyses, and references. Higgins, A.K., 1990: North Greenland glacier velocities and calf ice production. Polarforschung, 60, 1-23. 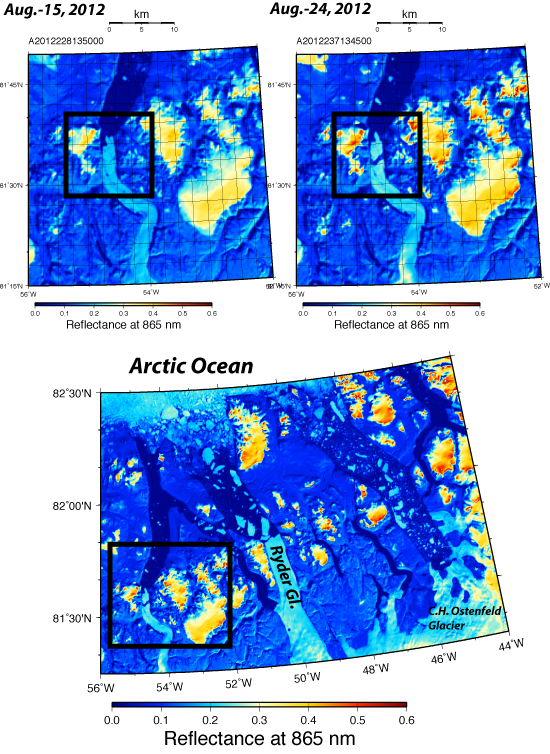 This entry was posted in Ice Island and tagged glaciers, Greenland, NASA, Steensby Gletscher. Bookmark the permalink. Zachariae Ice Stream losses in 2012 make Steensby’s look insignificant.